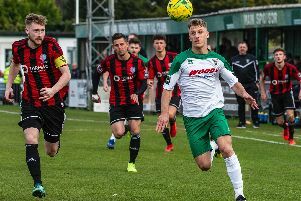 Bognor fell to another home defeat as Jake Turner's 83rd minute wonder strike for Brightlingsea Regent left the Rocks looking at a mid-table finish. It's been a bleak time at home for the Rocks of late although they did look like taking a point from this one - which they would have deserved. Joe Tomlinson returned to the line-up but Doug Tuck was out with an apparent hip flexor injury. Early on Bradley Lethbridge stretched the defence with a run down the right but his cross failed to find anyone. A Mason Walsh free-kick was swung in from the left and Keaton Wood rose in the box to head it but Regent were given a free kick. Morisi Gelashvilli did well to cut the ball across the Bognor area but the ball rolled out for a goal kick. Harvey Read was deemed to have fouled Aaron Condon and Turner took the set play on six minutes. A wonderful curling free-kick into the box found Matthew Cripps, who glanced his header beyond Dan Lincoln - an all-too-familiar start to a home game for Bognor. Tomlinson got forward and passed to Walsh but he trod on the ball. Lethbridge won a corner on the right and Harvey Whyte's low pass to Read in the box saw the defender blocked. Wood found Lethbridge but the defence blocked his attempt. Walsh got down the wing but Jake Gould shepherded the ball out of play. Chad Field was up for a Bognor short free-kick and received the ball with his back to goal and hit one at goal on the turn, but it was straight at keeper James Bradbrook. Reece Myles-Meekums used his pace to chip the ball to the back post and Lethbridge flicked a header on to an onrushing Tomlinson, who belted it over on 25 minutes. Richard Gilot went into the book after he blocked a free-kick. A long diagonal ball fell nicely to Whyte, who did well to control it before hooking the ball over to Lethbridge but his low strike was blocked by the solid Brightlingsea defence. A pass out to the right picked out Whyte and he swung the ball into Lethbridge, who nodded it back inside, but Walsh was blocked with a volley on the follow up and a second chance was also blocked. Theo Widdrington's curling free-kick was headed away before Gilot swiped a long-range effort wide on 50 minutes. Good build-up play saw Myles-Meekums find Whyte on the right but his cross was headed out. Jimmy Wild replaced Read for Bognor on 55 minutes. Walsh made a signature run from Bognor's half but under pressure from his defender he knocked his left-footed shot wide. Gelashvilli went into the book on 58 minutes when he fouled Walsh. Widdrington's curling free-kick was punched out by Bradbrook. Ricky Griggs floated a cross towards the back post but it ran out of play. Another cross from the right saw Whyte and Wild both miss the ball completely before Lethbridge curled a shot off the frame of goal. Then from the rebound Walsh was fouled. Griggs went into the book and Widdrington stepped up to slot in the penalty. Wild won the ball in Regent's half before he set Lethbridge through but the chance went begging and the striker slid in late on a defender and went into the book. Widdrington curled another free-kick at goal and Bradbrook could only push it wide for a corner on 73 minutes. Leon Maloney ran on to a loose ball and Bradbrook took him out, but got away with only a yellow card on 78 minutes when many felt it was a goalscoring opportunity. Widdrington's free-kick found Field but his header was deflected for a corner. Calls for a handball following the corner went unnoticed as the Rocks pressure mounted. On 82 minutes Walsh's corner found Wood, whose powerful header flew agonisingly wide. But Bognor went behind when they failed to defend a lofted pass, sitting off the attackers, and the ball fell to Turner, who hit it from outside the box high into the top right corner on 83 minutes. Frustrations showed as Wood went into the book for a late challenge on 87 minutes in the middle of the park. Condon's late freekick curled towards goal but Lincoln was equal to it. Widdrington decided to go for goal with a free-kick but the wind caught it and it flew wide. A nice turn on the left by Wild led to a cross to Maloney, who was unmarked - but he sent his header wide in the last chance of the game. Bognor must now lift themselves to face Brighton & Hove Albion U23s at Lancing's Culver Roadon Tuesday - at the earlier kick-off time of 7.15pm. Subs not Used: Sanders, McCormick.